As noted in the dialog box, all application registration is performed online, via clicking the Online Registration box. Verify that you have an active internet connection, click Help/Register Menu item, to open the appropriate URL. Follow the instructions that are provided with the URL. After your payment has been verified, copy the provided Activation key, and past into the above text box, below the Activation Key Label, and press the Activate button. 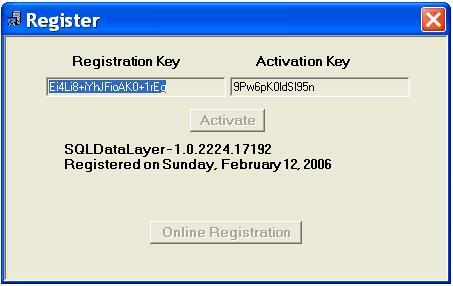 An activation key can also be created by emailing Sales@SQLDataLayer.com, please include the Registration key that will be shown just below the text Registration Key. The Registration Key is unique to your installation, and must be copied from your installation, do not send the above key. Please include your payment verification prior to sending your email. 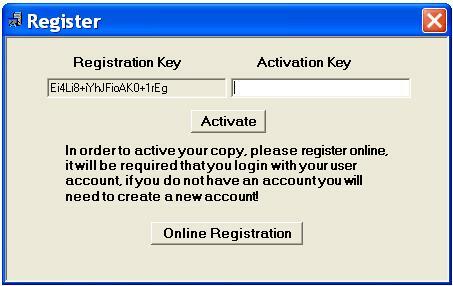 After your have entered your activation key, and pressed the Active button, your Register Screen will appear as shown below, with your Registration Key and Activation key, with the date that you Activated your Software.